OK, I will admit one of the things I love about being blessed with a gorgeous baby girl is having all manner of cute little outfits to dress her in. So when the wonderful people at Disney got in touch saying they’d love to send us a couple of pieces from their new collection we predictably jumped at the chance. 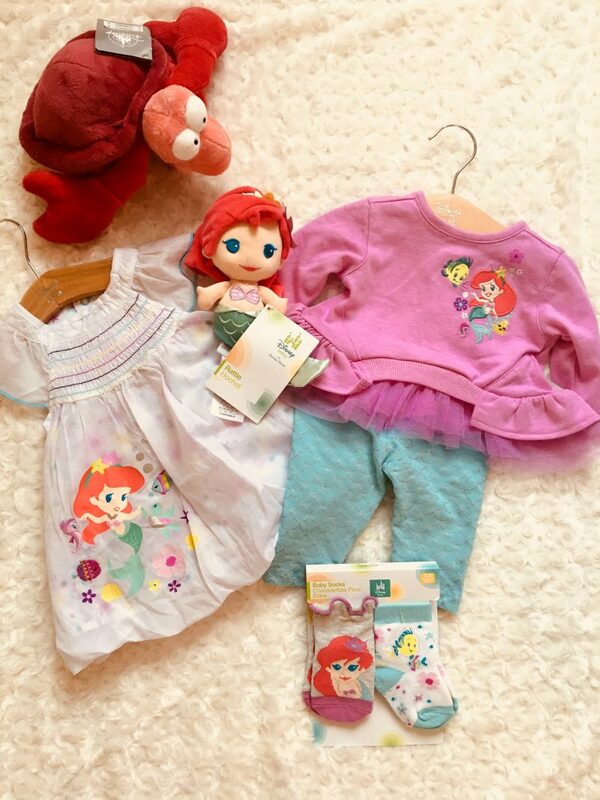 And fortunately for me everything was all from The Little Mermaid collection – my all time favourite Disney classic! I remember as a child, visiting the Disney Store was the ultimate treat…. who am I kidding it still is! The range of products is vast and of such great quality. We were sent a couple of gorgeous bits including this beautiful white dress. I have to admit with Hollys dark hair she looks beautiful and I love the quality of the fabric. It will be perfect for summer as it is quite light weight but it can also be paired with some leggings whilst we patiently wait for spring to show its face! 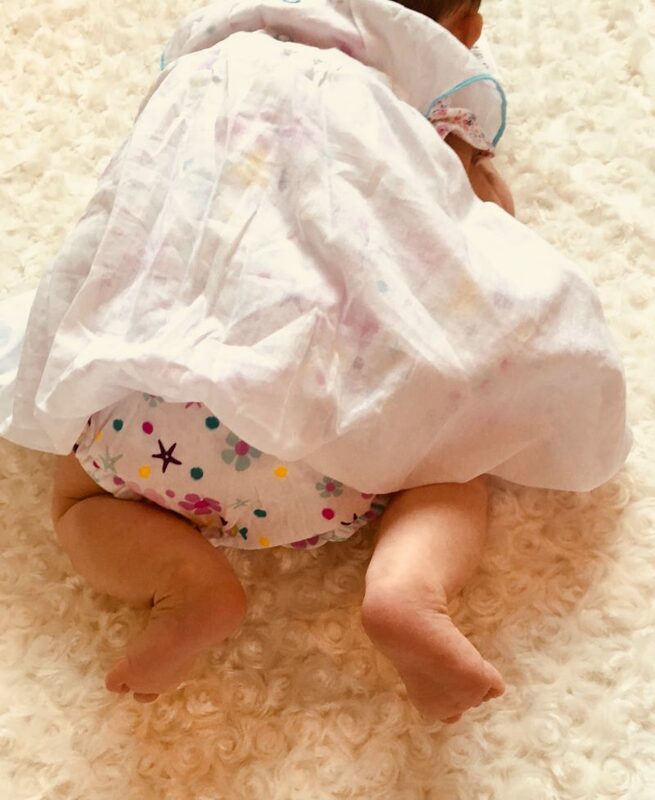 To add to the cuteness it comes complete with a little pair of bloomers (we don’t want an unsightly nappy ruining the look do we! 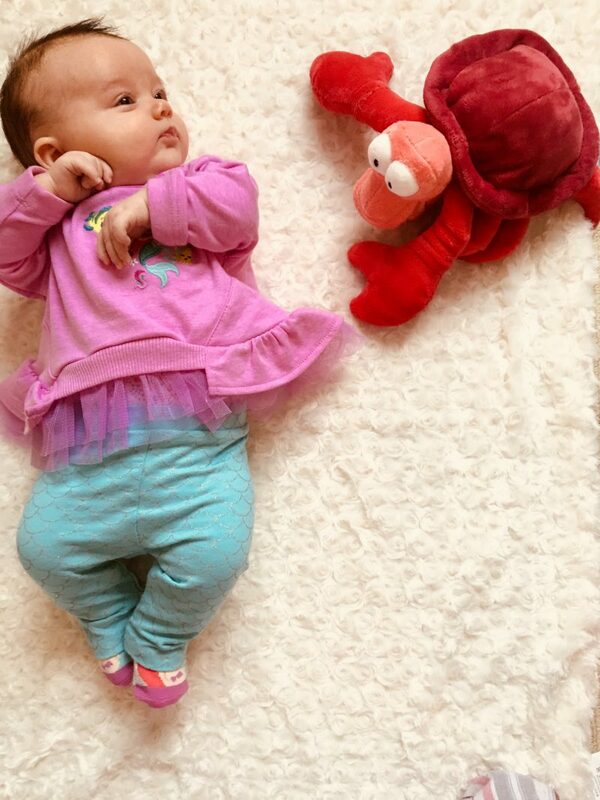 Holly is already showing an interest in toys and immediately was drawn to her very own Little Mermaid. It will actually be a fantastic Sensory style toy as it has a rattle, a shimmery material for her to feel and super soft hair. I love that Disney have thought of these little things; at this age it’s a great way for Holly to explore different touches with her little hands. Isn’t it adorable. I love this little peplum top (my girl is on trend) and leggings. The leggings come with a scallop detail to add to the theme and the peplum top is incredibly soft. This is the perfect outfit for this time of year and her little feet are even catered for with matching socks! I also love that this will be an easy change outfit – lets face it these little ones often need to be changed quickly and both these outfits aren’t too fussy to change and are easy to change nappies in! Hollys final little treat is the legend that is Sebastian! If you don’t start singing “Under the Sea” at the mere sight of him then something is wrong! It’s quite big for her to hold at the moment but is taking pride of place in her nursery (and out of sight of her big brother who already has his beady eye on it). It’s been such a privilege to try out these amazing products – I have to admit I’ve been sceptical of such products before, worrying they may verge on the edge of tacky but these are absolutely beautiful. And if you fancy indulging and treating your little ones to some of these gorgeous pieces go and check them out here. Disclaimer: Disney very kindly sent us these products in exchange for an honest review. All words and opinions are my own. Previous Post A Changing Bag for a Baby and a Toddler! !